Keep your guests refreshed while keeping your wallet full with the basic smooth finish 12 oz stadium cup. Add your custom logo to put your brand in their hands. 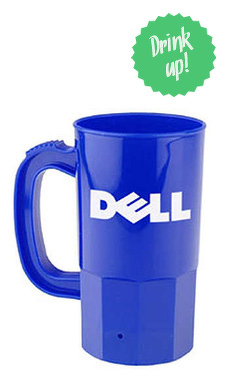 Put an entire can of whatever beverage you want in this customizable Beer Stein with options to add your personal logo. This customizable stadium style cup allows you to display a custom color imprint while holding up to 16 oz of liquid. The solid plastic it is made out of allows for use over and over again. Carry a large amount of your favorite liquid with this personalized Beer Stein with options to add your customized logo. If you want the convenience of being able to carry around more than one drink, choose this custom stein. Add a logo and show off on this large custom stein.